This is a vatting of single malt whiskey from the Cooley distillery, which is quite different from the rest of the Tullamore range. Casks that had previously held Madeira, Sherry and Port wines are used for the maturation along with ex-bourbon barrels. This unpeated malt has a rich a full flavoured character with hints of spice, dried fruits and cholate. Nose An unusual combination of earthiness and tropical fruits, giving us a wild contrast of pineapple, freshly cut grass and toasted wood. Palate A complex combination of fruits and woods to produce a rich Christmas cake flavour. Fruits abound here with the tropics to the fore, pineapple, apricots, with a hint of raisin and even figs. The finish delivers a wonderful earthy yet rich fruit combination of apricots and sultanas. Types of Barrel used for Aging four different types of cask: old bourbon, dry oloroso sherry, port and madeira. Serving Suggestion Best on its own or with just a little water. A fantastic release from Tullamore Dew. 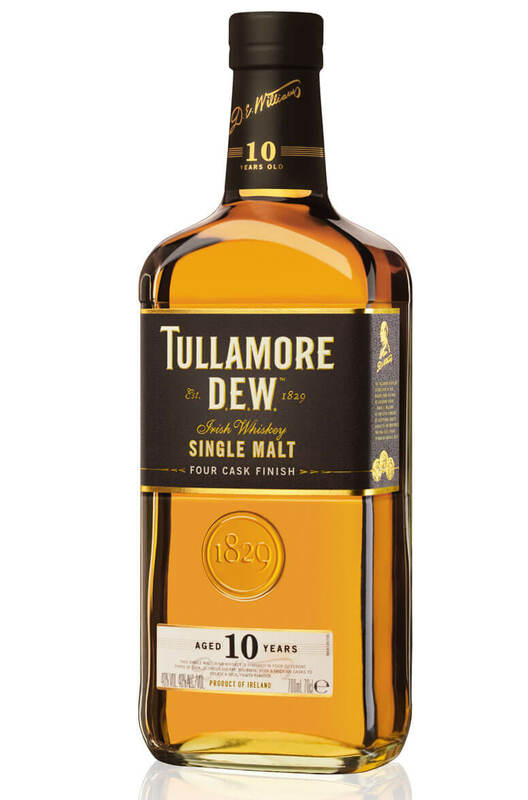 This combines pot still, malt and grain whiskeys all togethe..
Hand selected casks of Carribean Demerara Rum have been used to finish the Tullamore D.E.W Original ..
A marriage between Irish Whiskey & Irish Cider - the Tullamore DEW Cider Cask Finish! This whisk..